This module displays room layout by floors. The layout shows rooms status (Check In, Reserved (Confirmed and unconfirmed), Day Use, On Departure, On Preparation, and On Maintenance. The status (On Preparation) is assigned to rooms after check out and the module HRS clears this status after preparation of the room. The module also changes the status of the rooms to (On Maintenance) to prevent any operations on it until the maintenance is complete. After maintenance completion the module records the maintenance items and their costs and clears the maintenance status. The module also issues a number of reports and inquiries like Guest list, Occupied rooms, Guest meals List, Vacant Rooms, Room Status Summary, and Resident Guests. The users of the module (HRS) can search by room number and/or Guest name. GAS : General Account System and database. HBD: Hotel Basic Data Module is required for the definition of room types, rooms, taxes and other basic data. 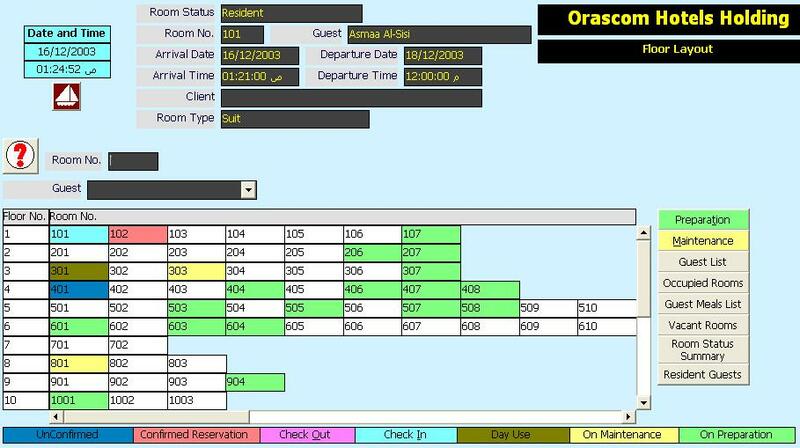 HFO: Hotel Front Office Module is required for the Hotel operations that change the rooms status.